A new kind of interactive toy that's tested dog tough! Fill with treats, dog food, or any of your dog's favorite snacks for interactive fun. You can even turn meal time into a treasure hunt by feeding your dog out of the Starmark Everlasting Chew Ball. Read 11 customer reviews of StarMark Treat Dispensing Chew Ball. The average customer rating is 5. Frankie the staffy loves his StarMark ball and is never without it! He is a power chewer and has destroyed just about every toy he's ever owned. The StarMark has only needed to be replaced once in 6 months due to general wear and tear so I think it's money very well spent! Strong, chewable, bouncy ball with room for treats and my German Shepherd loves it. It is safe, virtually indestructable and he loves playing with it. I have bought these chew balls for my Germans shepherds and they are fantastic . Large enough so they don't go down the throat , tough enough that my dogs can't rip them apart and they last for years. The dogs love them . My dog Daryl is nearly 2, he is cross blue heeler and this ball is the only toy to last more than 1 year. I put small amounts of cooked meat inside and he spends about 10 minutes trying to get it out. He loves this ball , not only is it fantasically bouncy but he uses his mind to retreive the meat.without a doubt the best toy ever especially for a dog that has strong sharp teeth.do yourself and pet a favour buy this ball. This is my dog's favourite ball. 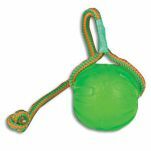 We actually don't use it as a treat dispensing ball - just for fetch. Daisy just seems to like the texture of it, so she carries it in her mouth a lot. It seems pretty indestructible. This is a great product. However we don't use it as a treat ball. As it is very hot where we live, we take the dogs to the dog park at night. 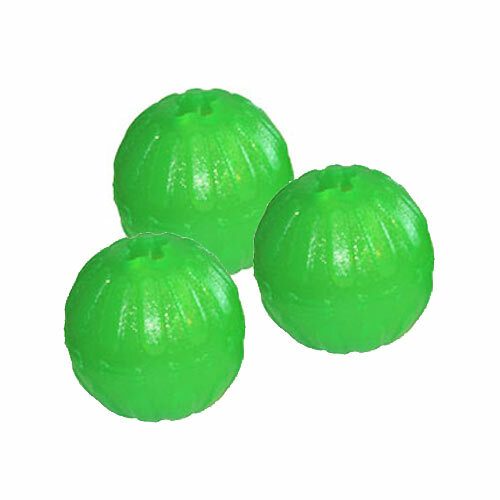 We put a glow stick (15 cm) inside the Treat Ball and then if the dogs get distracted and drop the ball when fetching, (which often happens), we can find it easily. The glow sticks rarely come out of the Treat Ball and, even though our dogs chomp the ball on returning, the glow sticks don't break. If the glow sticks (not the ball) are put in the freezer, they will last for up to three nights. The Treat Balls last for a long time (years) even with this treatment. I was very surprised at how bouncy this ball was when playing fetch, a great versatile ball which I have tried stuffing some treats in, Indi cannot get the treats out, but he brings it to me and I extract the treat for him which he really appreciates. I think this will be a great addition to our kit. My PWD is a huge chewer and she hasnt chewed this toy to bits. Its been a good buy and a good throw ball as well. First bought two of these balls 4 1/2 years ago for my dogs a German Shepard and Kelpie, just had to replace the Kelpies ball, good value for money when they last this long.